Incidently I am a connois[s]eur of comics, or do I mean connoiseuse? anyhow, [sic] have found in the funnies subtleties both of drawing and of dialect which seem to me supremely funny. The "Snuffy Smith" series, taking place in the feud-country of Tennessee or thereabouts is full of the most delightfully apt colloquialisms. Consider the bearded ancient who cocked an eye aloft at a lowering sky and remarked, "Hit's a-clabberin' up fer a shower". And "do-less" is such a descriptive adjective. And "Time's a-wastin'" has become a by-word at our house. The artist must have spent quite a bit of time and effort collecting such gems of dialect -- must be authentic, for no one could make up so many such apt ones. 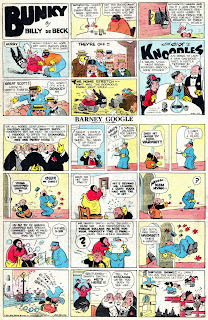 And nowhere but in the comic strips and funnies does one encounter such deft subtlety in delineating moods and expressions with a few strokes. The grotesque little characters can assume marvelously apt attitudes -- bewilderment, despair, speechless confusion -- all achieved with a few dots and lines. I think if the funnies could be preserved for a few thousand years and shown to a new civilization, they'd convey in fewer words and pictures, and such more accurately than anything else could do, the daily life of our present age. Certain selected funnies, of course -- one in particular that I have in mind shows with exquisite aptness the ridiculous things that happen to all of us -- the day when everything goes wrong, the time when the phone rings with an important message and you run downstairs losing your slippers in the process, stumble over chairs, trip on rugs, and reach the phone to find the baby has just hung it up. And then there's the dry humor of "Skippy", the timeliness of "Mr. and Mrs.", and the vividly familiar dilemmas of "Out Our Way" -- certainly the funnies have progressed a long way since the "Bang-Powie-Plop" era. 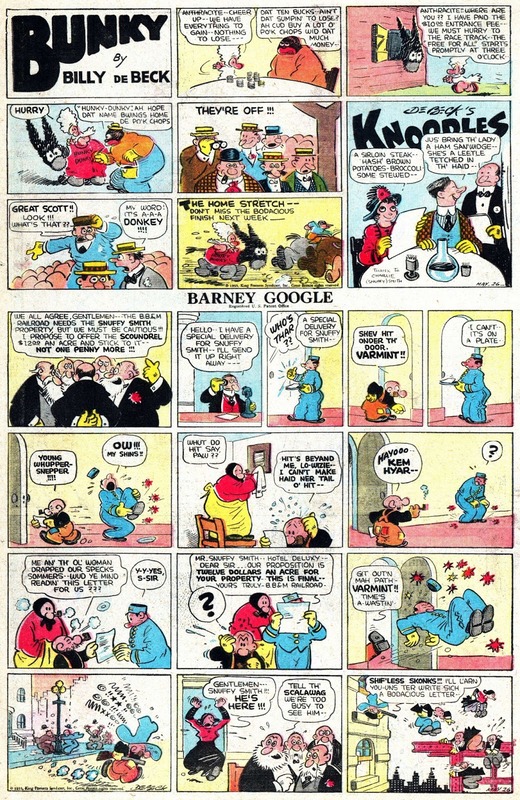 Barney Google Sunday, May 26, 1935.